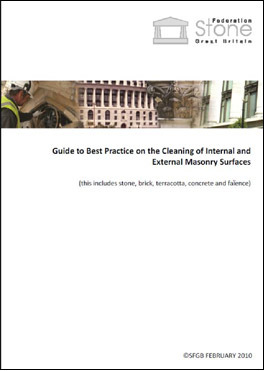 The Guide covers all aspects of cleaning external and internal masonry surfaces, including stone, brick, terracotta, concrete and faïence, and is available to clients, architects, specifiers and Stone Federation members only. Price | This code is £20.00 (£15.00 for Stone Federation members) including postage and packing (postage charge for overseas). Bulk Orders | A discount of 10% is offered for orders of 5-9 copies and a discount of 20% is offered for copies of 10 or more. This offer applies to the above Guide to Best Practice only.